In case the weather strikes bad and in worst case scenario, we will move into the social hall. Today, our picnic starts with breakfast at 10.00am, after Mass. Do not worry too much about the weather forecast. Rain or shine, it's our big day, Parish family outing, first thing in this summer. It may shower after 2pm; if so, let our kids enjoy the rain and play in it, a rear opportunity to enjoy the Kerala/like monsoon that we all miss so much! Last night so many of our volunteers from both parishes did work hard to prepare food and for all other arrangements in detail. Also a surprise Thattu-Kada is also being set up! Sports and games team is all ready and kids will play and compete on group basis. Adults will have lots of chances to have fun! If you want to sit and play cards, a big 20/40 tent has been pitched. Come and join and have the faith that the Lord will provide us with a fun day to reward all our good efforts in further building up our Parish family. Please pray a Hail Mary for good weather. 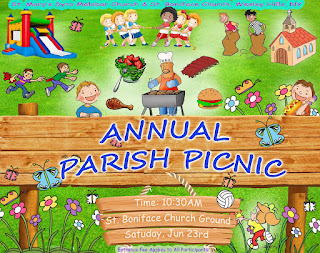 Welcome all to the Parish Picnic on this Saturday! 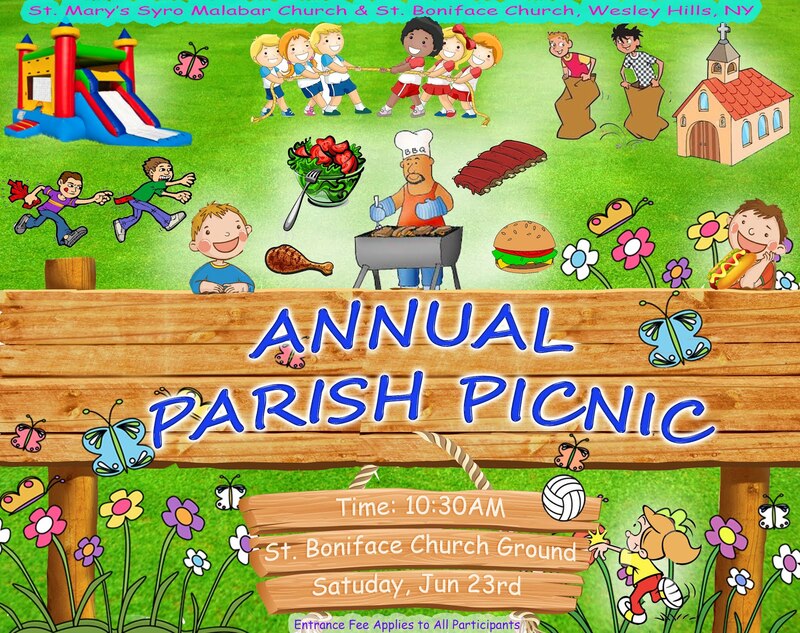 We would like to invite you and your family for our Annual Parish Picnic on Saturday June 23rd 2018 after the 9 am mass. The registration fees for the Church Picnic will be $30 per family & $10 for individual. Please include your church Env # with the payment for easy registration. There will be bouncy houses for children from 11am to 2am. Volunteers are needed on Friday evening (June 22)to help set up for the picnic. Church Picnic, Next Saturday June 23. 10.30am to 4.00pm. Venue: Church grounds. New to this year, there will be Bouncy House for children from 11AM to 2 PM. On behalf of St Mary's Church, we are inviting all Parishioners to this he event. Just a reminder that Sunday Lunch will not be served from tomorrow, until 1st Day of next CCD year(Sept 16,2018). Please see down below this mail the way we do Adoration tonight. I am traveling to Tampa FL for Deacon Rajeev's priestly Ordination in the afternoon. I will be back by Saturday night. From Monday, June 4 to Thursday June 21, I will be on vacation. During that time I will make personal pilgrimages to Lourdes, Fatima and Assisi. My prayers will be with you all. Adoration Tonight will be coordinated by THOMAS George.